Having stressful days and sleepless nights? Maybe it’s time to make your great escape to one of these incredible Indonesian destinations: Bandung, Belitung, Medan, or Yogyakarta. With picturesque landscapes and boundless nature, there’s no better place to switch off, relax and recharge. 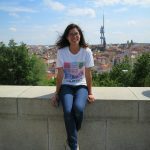 Find out more about these destinations now ! Bandung goes by the moniker of “Paris of Java” and this quaint city might just be as charming as its European counterpart. 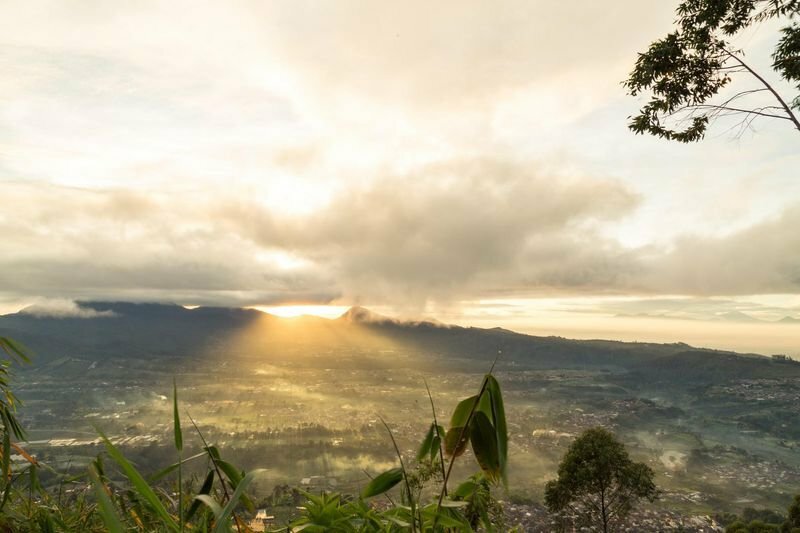 From mythical misty volcanoes to hectares of luscious tea plantations, Bandung is a booming metropolis with plenty of unconventional adventures and picturesque sights — guaranteed to soothe your eyes and soul. Whilst wrapped in thick outerwear layers atop its chilly highlands, you might actually forget that you’re still in Southeast Asia! The best part? It’s a mere 2-hour flight away from Singapore, and SilkAir flies from Singapore to Bandung daily. Book your flights on SilkAir to Bandung now, with all-in return fares from just SGD188! Located in Ir. 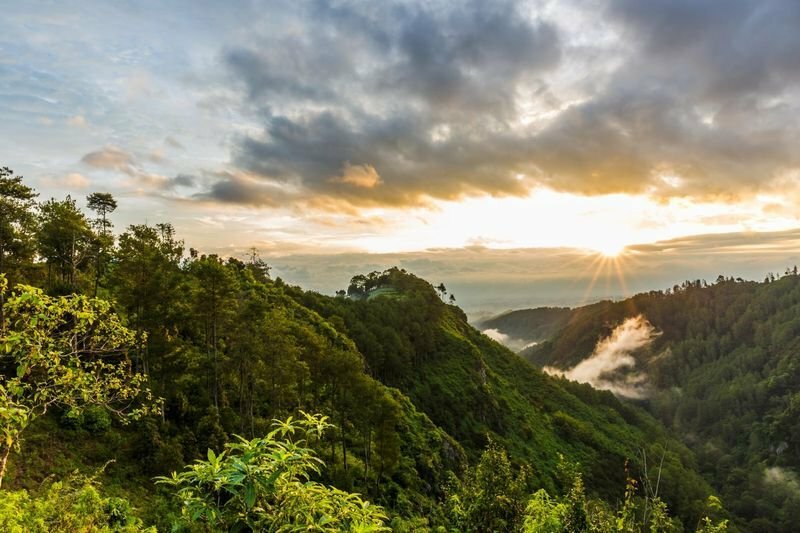 H. Djuanda Forest Park, Tebing Keraton is a majestic cliff that presents a jaw-dropping, panoramic view of magnificent mountains, lush forests and rice paddies. For an even more spectacular view, go there in time to catch the sunrise or sunset and watch as the golden rays of the sun transform the gorgeous scenery below you into a surreal, radiant spectacle. Often shrouded in mist, it’s a mystical experience that’s well worth the trek up through the park! You’ll feel like you’re on top of the world, so don’t miss this once-in-a-lifetime chance to be dazzled by the amazing sights that Bandung has to offer! Cost: The entrance fee costs 76,000 IDR (~ S$7) for tourists. Getting there: You won’t be able to find it on Google Maps, so the best way is to rent a private car with a local. And of course, the famous Tangkuban Perahu has to be on this list! Located in Lembang, this volcanic mountain’s crater constantly emits sulfur, so go prepared with a mask. The mountain comprises of three main craters – Kawah Ratu (Queen Crater), Kawah Domas (Domas Crater) and Kawah Upas (Upas Crater) where tourists can explore. To refresh your soul, spend some time away from the city up here in the mountains. Luxuriate in the cool mountain air, take a stroll in the forest, revel in the captivating views that nature has to offer and let all your worries melt away. Cost: If you’re planning to make a trip here, you might want to go on a weekday ( 200,000 IDR/ ~S$20.20 per person) as entrance fees are more expensive if you visit on a weekend ( 300,000 IDR/ ~S$30.30 per person). Getting there: Tangkuban Perahu is a 90-minute drive from Bandung on weekdays. The easiest way to get there is by joining a tour or rent a car. Alternatively, you may take a minibus from Bandung’s minibus terminal in front of the train station, to the park entrance of Tangkuban Perahu. 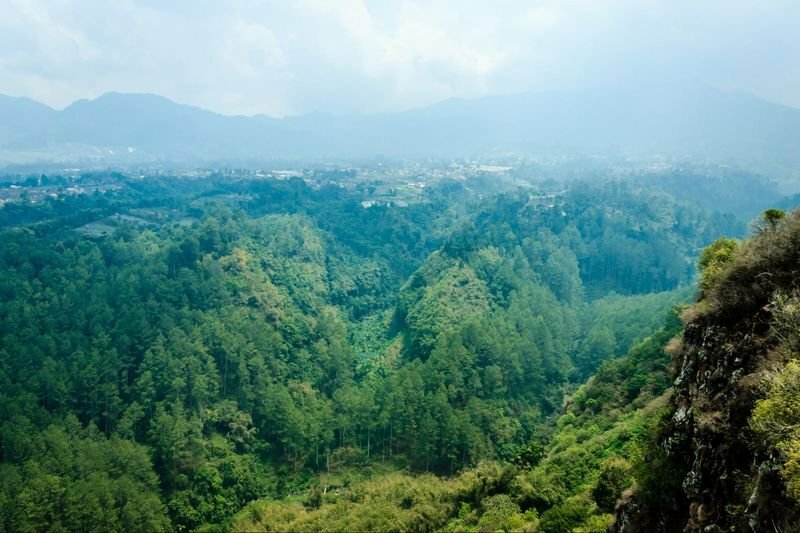 Can’t wait to hike up Bandung’s most iconic volcanic crater? You’ll be delighted to know now’s the best time to go with all-in return fares from SilkAir starting from SGD188! 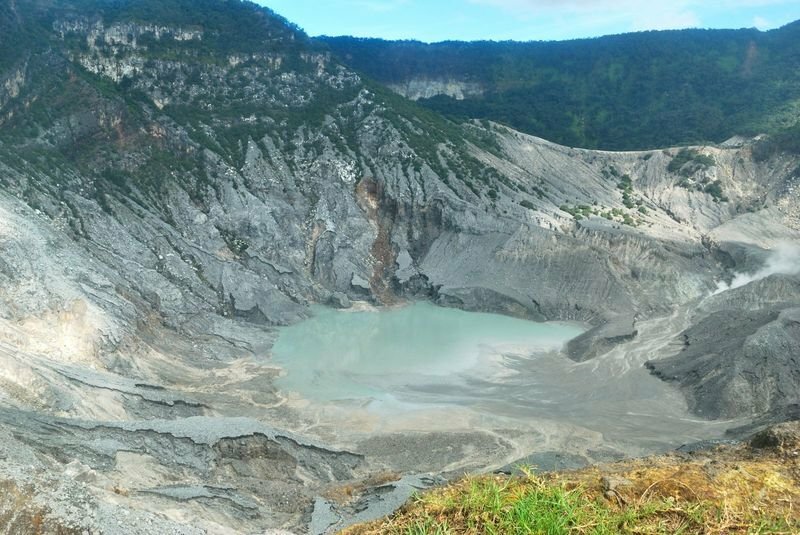 Kawah Putih, also known as White Crater, was formed after the eruption of Mount Patuha. A visit to Kawah Putih, with its soft white sand and crystal clear waters, will make you feel as if you’re transported to a magical land. The colour of the water changes according to the weather conditions in the area, so one visit here might not be enough to witness the truly mesmerising beauty of Kawah Putih. Cost: The entrance fee is about 50,000 IDR (~S$5) per person with an additional 6,000 IDR (~S$0.60) car entrance fee. Getting there: We recommend going on a day tour by car, because Kawah Putih is one of the hottest tourist spots in Bandung. If you have limited time, going on a day tour will give you more flexibility and time to explore the nearby sights as well. If you prefer public transport, you can take the Ciwidey bus (IDR 6000) from Leuwi Panjang Bus Terminal, and then an angkot (minibus) to the entrance to Kawah Putih (IDR 7500). But take note that the journey will be three hours in total. Enticed by these amazing views? Take in copious breaths of fresh air when you visit! Book your flights on SilkAir to Bandung now, with all-in return fares from just SGD188! Legend has it that Lake Patenggang was built to celebrate the reunion of two separated lovers. They created the lake together with a boat that lay within it – the boat being what we know as the tiny island of Pulau Asmara (Amour Island). According to the legend, couples will enjoy everlasting love should they visit the island! But Lake Patenggang is not just for lovers! 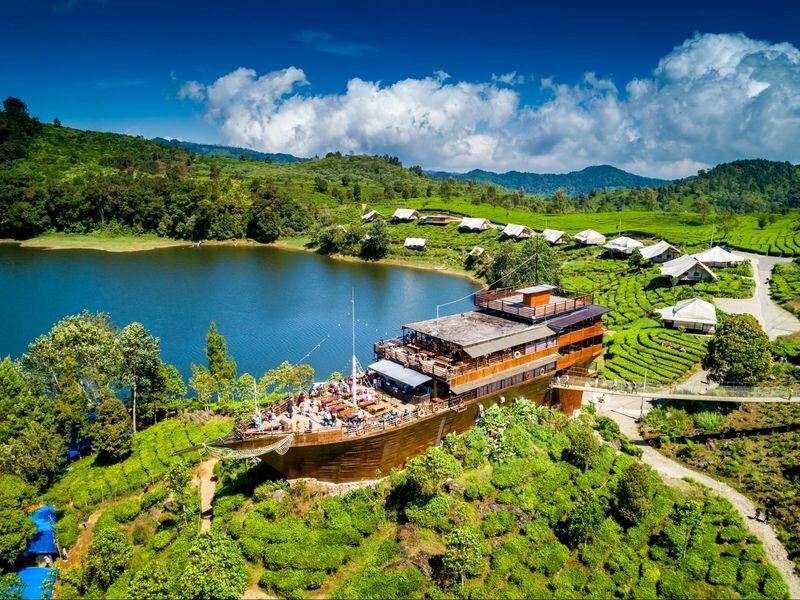 It’s a beautiful lake high above sea level, so it’s always cool and surrounded by abundant greenery and tea plantations. Enjoy a laid back picnic on the banks of the lake, or rent a boat and take a trip across the lake! You can also set up camp there, go glamping or stay in one of the new resorts around the lake. There’s also an iconic Pinisi boat-shaped restaurant at the edge of the cape at Lake Patenggang which offers a dining experience with priceless views to boot. Cost: If you’re planning to make a trip here, you might want to go on a weekday (135,000 IDR / ~S$12.60 per person) as entrance fees are more expensive if you visit on a weekend (185,000 IDR/ ~S$17.33 per person). The entrance fee for cars are priced at 11,500 IDR (~S$1.08). Getting there: Lake Patenggang is located just 7km away from Kawah Putih, so you can combine both places with your day tour or private car rental. The little ones, brimming with energy, will find delight in the water slides and splashing about in the water. While the slides keep the kids busy, the adults can reward themselves by soaking in the pools and letting the natural hot spring water work their magic. Finally, time to relax without any distractions! Cost: Entrance fee to the park for non-staying visitors is 20,000 IDR (~S$2) per person, inclusive of a complimentary soft drink. An additional fee of 50,000 IDR (~S$5) will be charged per person for use of the pools. For those who are interested in staying here, the resort has a variety of accommodation options for you to choose from, starting from 850,000 IDR (~S$86) a night. Getting there: We recommend renting a private car to get to the Ciwidey Valley Resort. 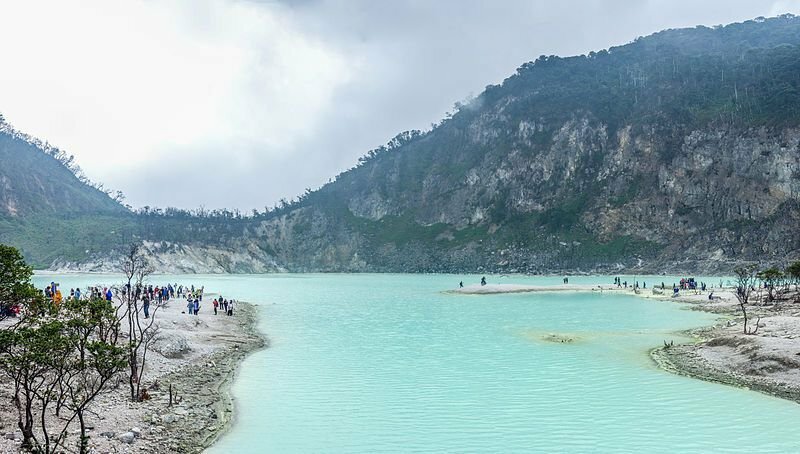 Plus, it’s located just minutes away from Kawah Putih, so you can combine your visit. You don’t come by a hot spring park often, so this is your chance to take a refreshing dip at the Ciwidey Valley Resort! Book your flights on SilkAir to Bandung now, with all-in return fares from just SGD188! Though not as popular as the well-known Tangkuban Perahu, Gunung Putri’s beauty should not be overlooked. Located in Lembang, one hour’s drive away from central Bandung, it provides you with a refreshing change of scenery should you desperately need a break from the hustle and bustle of city life. Plus, you get an incredible view of sunrise over Lembang from the top of Gunung Putri, overlooking the verdant pine forest below! Watch as the sun’s rays filter through the clouds and gleam in the horizon, it’s a truly ethereal sight to behold. Getting there: We recommend renting a private car because Gunung Putri is an hour’s drive away from central Bandung. This café in Bandung brings ‘dining by the pool’ to a whole new level, allowing you to (quite literally) dine within the pool itself. Uniquely structured, the One Eighty Coffee & Music establishment boasts a lush vertical garden, a cosy interior, and – would you believe it – a pool with tables in it. Visit on a swelteringly hot afternoon and gain some respite from the heat, as you dig into a wide variety of food whilst submerging your feet in the cool waters. Once night falls, the pool is illuminated in a soft glow, transforming the compound into a magical fairyland. Serving up a range of dishes from Western to Thai cuisines, priced between 24,000 IDR to 100,000 IDR (~S$2.40 to S$10.10), your stomachs won’t be the only things leaving the place happy – your wallets will too! If you’re thirsty, the café has coffee, tea and even cocktails priced between 18,000 IDR to 35,000 IDR (S$2 to S$3.50). Desserts like S’more Lemon Cheesecake (35,000 IDR/ ~S$3.50) and Coffee Ice Cream Cake (38,000 IDR/ ~S$3.80) are also available. Tucked high up in the mountains, Lereng Anteng Restaurant offers a breath of fresh air far away from the city’s hustle and bustle. 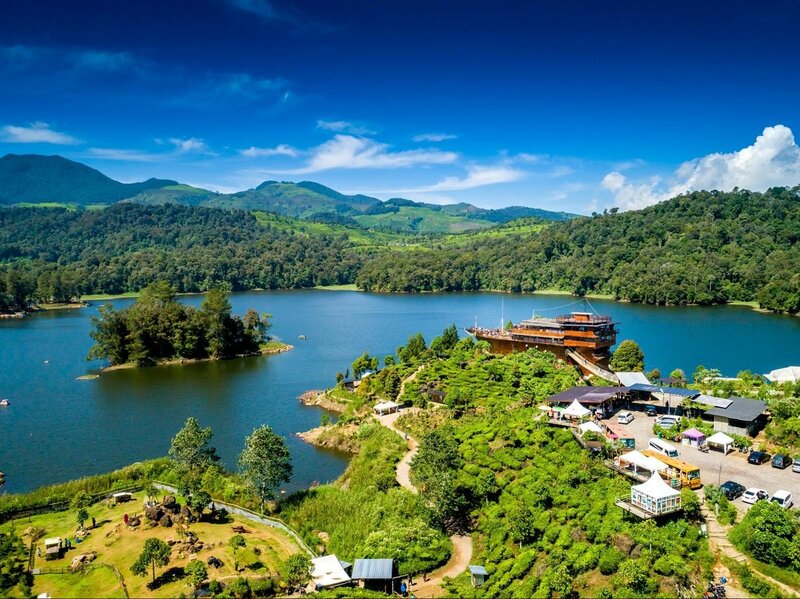 The restaurant offers a cliff-side retreat complete with spectacular views of Bandung, fantastic coffee (we heard that Vietnamese drip coffee is available as well), as well as delectable Indonesian fare that will set you back about 15,000 IDR to 30,000 IDR (S$1.50 to S$3). Some items that can be found on their menu include Nasi Ayam Tulang Lunak (soft bone chicken rice), Sampeu Goreng (Indonesian fried cassava) and Roti Bakar (grilled toast). There are bean bags and tents available for those who wish to lounge around and enjoy the crisp mountain air. You’ll easily be able to spend the whole day here, so come prepared with a book or some games to play with your dining companions. Resembling a majestic villa of sorts, the Kampung Daun Café promises no less. Located within a nature reserve, the café offers diners the chance to escape into a world of serenity. If you’re looking to have a private dinner, you’d be delighted to find that the restaurant actually consists of multiple individual and private dining huts. Waiters are summoned by hitting bamboo against each other and your food will be delivered right to your tent. At Kampung Daun Café, you can pick from a selection of local Indonesian cuisine or Western cuisine. If you can’t decide, why not have a little of both? Feast on a margherita pizza (38,500 IDR/ ~S$3.90) or a plate or Bebek Keremes (fried marinated duck with steamed rice and sambal; 97,500 IDR/ ~S$9.90), and you’ll surely be left wanting more! Situated in Majalengka are the Argapura rice terraces which look like something out of a painting. 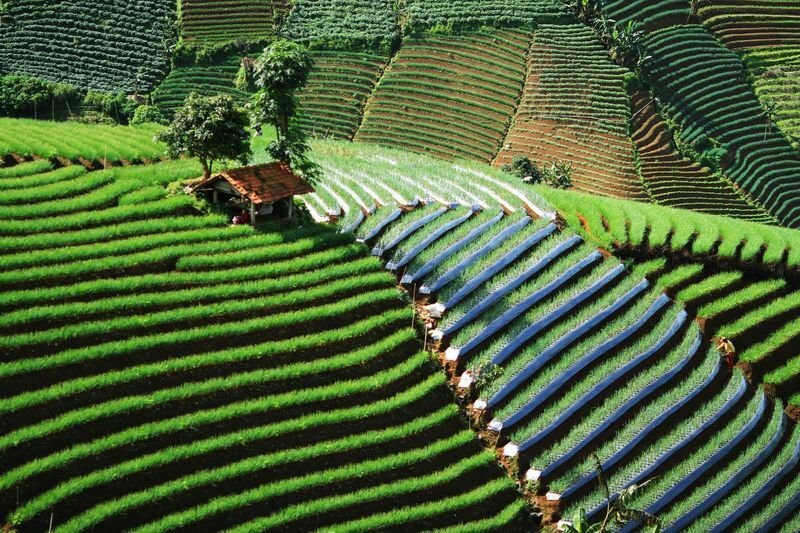 With its beautiful and neat rows of crops that stretch endlessly in all directions, the Argapura rice fields are undoubtedly a work of art that you have to experience for yourself. There’s nothing quite like standing at the peak of Cibuluh Hill to take in the panoramic views, a sublime experience that you definitely don’t want to miss! Getting there: The rice terraces are a 4-hour drive away from Bandung, so we recommend renting a private car or going on a day tour with a local guide. Next stop: Bandung! If Bandung has never crossed your mind as a holiday destination before, it’s about time to have it on your list. It’s one of Indonesia’s hidden gems, boasting numerous incredible nature attractions. 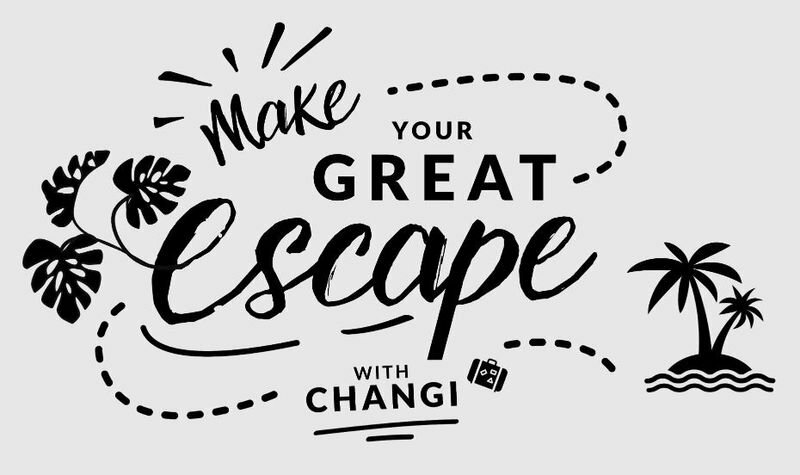 Start planning your trip to Bandung now and you’ll be all set for an epic trip! Wait no longer, book your flights on SilkAir to Bandung now, with all-in return fares from just SGD188! For more great deals on other Indonesian destinations, click HERE. And stay tuned for the rest of this 4-part series, featuring picturesque spots in Yogyakarta, Belitung, and Medan!